Most people are able to wear contact lenses safely and comfortably. There are contact lenses that correct for nearsightedness, farsightedness, astigmatism, and other vision problems. An optometry exam can determine what lenses are appropriate for you. Are contact lenses safe for my eyes? Millions of people wear contact lenses without any difficulties. Following recommendations for inserting, removing, cleaning, storing, and replacing contacts typically keeps your eyes safe and healthy. However, you should talk to your eye doctor if you have specific concerns about contact lens safety. What is the difference between hard and soft contact lenses? Soft contact lenses are made of plastic combined with water. Soft lenses allow oxygen to pass through the material to your cornea, nourishing and soothing the surface of your eye. Rigid gas permeable contact lenses, sometimes called “hard lenses” are made from a stiffer, oxygen-permeable material. They are often used by individuals with astigmatism or higher-order aberrations. How often should I change my contact lenses? The frequency with which you should dispose of lenses depends on the contact lens type. 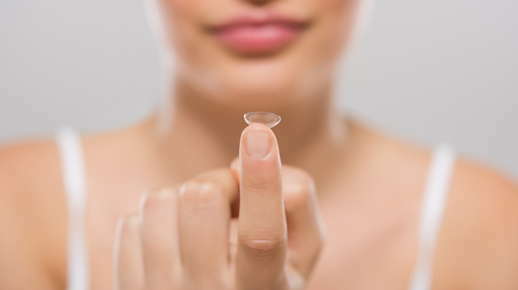 Some lenses are made to be disposed of each night, while others may last several weeks. Talk to your eye doctor and read the instructions on your contact lens package to determine the replacement schedule for your lenses. Is it possible to lose a contact behind my eye? No. If you rub your eyes or swim underwater with contacts, it is possible to dislodge your contacts. Usually, they can be found under your upper eyelid and removed without difficulty. How long does it take to adjust to wearing contacts? If you’re not used to wearing contacts, you may notice them or feel slight discomfort for a day or two. As you become accustomed to the contact lenses, you will no longer even notice that they’re there. There are a lot of variables to consider when choosing contact lenses. Think about your typical routine and consult with your eye care provider to find the perfect contact lenses for your lifestyle. "We use Anderson Optometry for all of our family’s vision needs. Recently, we had to have our youngest fitted for new glasses and he made the experience fun for her and informative for us. We know Dr. Anderson will always take good care of our family’s eye care and that’s why we wouldn’t go to anywhere else." "Dr. Anderson and his staff are so patient and friendly. Dr. Anderson prescribed me glasses and I had the toughest time picking out frames. They didn’t rush, but instead made helpful suggestions and now I have an awesome pair of frames, not to mention the fact that I can see ten times better than before. You guys are the best!"